The purity of the window depends not only on the comfort in the house, but also the mood. Contaminated glass hold the sun's rays, it not only prevents sunlight to enter the home, but inspires its inhabitants melancholy and depression. Traditionally, the Windows washed after the summer and winter season. Washing Windows few a pleasure, so almost all Housewives dream to deal with this as quickly as possible, but it does not have stains on the glass. To speed up the process, use rags made of microfiber, which easily absorb moisture quickly are rinsed, does not leave streaks and stains. Do not use detergent for dishes. With their help, you will not cope with the task quickly, as you will have long and hard to get rid of the foam, from which the glass for a few hours will remain the stains and the cloth will have much time rinsing in clean water. The fastest way to cope with the dirt on the window frames and the glass is to use modern means in aerosols containing alcohol. First carefully spray the frame, in 5 minutes you effortlessly remove dry with a clean cloth microfiber all impurities. Then take a clean cloth, lightly spray the glass and wipe clean. If glass is very dirty, you'll have to take a third rag and repeat the procedure. The frame and glass are completely clean, and you don't have to deal with buckets, basins, soap stains and Newspapers, which need to RUB the glass for the reason that a rag just can't remove the foam, how much would you her rinse in clean water. To clean the Windows quickly and without the use of special tools. To do this you need ammonia and warm water. Add 5 liters of water 10 tablespoons of ammonia, divide the volume into two parts. In one container you will wet the rag and wipe the frame with another clean cloth to wipe glasses. Then you will need two clean, dry rags, one for frames and one for glass. 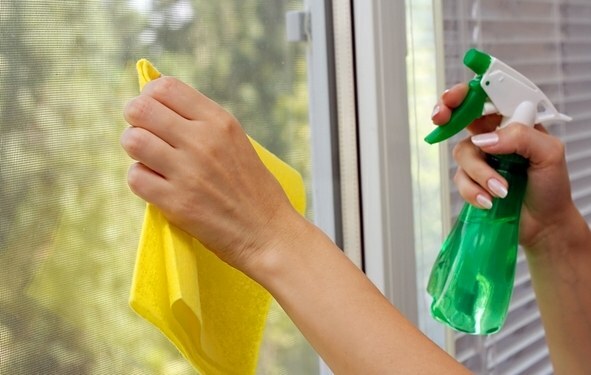 Clean the Windows with ammonia can be no less quickly than when using aerosol cans, the only drawback is that the procedure is more troublesome.